Freddie Mercury was one of the greatest frontmen in rock and roll. He was known for his outlandish and flamboyant stage personality as well as his powerful four-octave vocal range. He didn’t consider himself a “storyteller” through music, rather he was propelled by simplicity through his inspiration for his music and often cited love as his muse. Freddie set out with superstardom in mind as he was very outspoken about becoming a legend. Freddie was most well-known for his work with Queen, but he also had an established career as a solo artist and even a producer. Mercury came from humble beginnings and at one point worked as a baggage handler at London’s Heathrow Airport. Mercury was born in Stone Town, Zanzibar (now Tanzania) and his family originally moved there so that his dad could continue his career at the British Colonial Office. He grew up between Zanzibar and India before moving to Middlesex, England when he was a teenager. Early in Queen’s career, Freddie was apparently mid-show when his mic stand snapped in half. Instead of having it replaced, Freddie just used it as-is and this became one of his many trademarks on stage. In the early 1970s, Freddie had a long-term relationship with Mary Austin, a friend who he met through Queen guitarist Brian May. Mercury lived with Austin for several years in West Kensington, but by the mid-1970s, Freddie had an affair with a male American record executive at Elektra Records. In December 1976, Freddie told Austin of his sexuality, ending their romantic relationship. He moved out of their flat, and bought Austin a place of her own nearby. They remained close friends for the rest of his life. 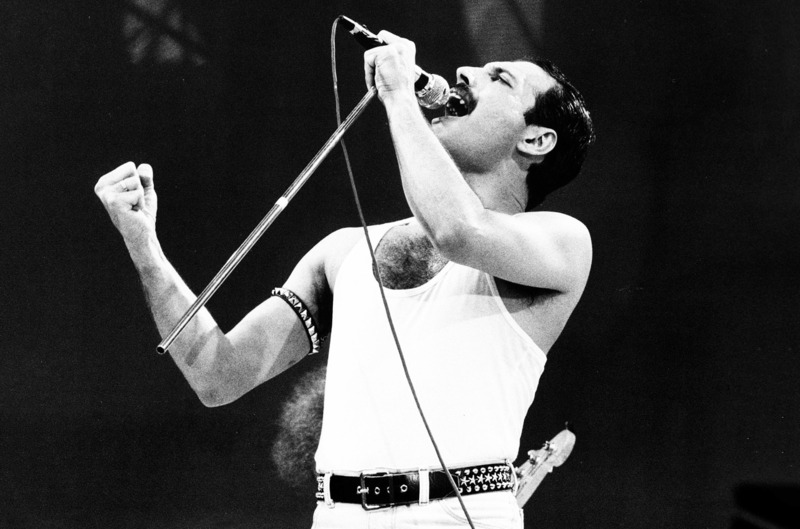 Tragically, Freddie passed away aged just 45 with the cause of death being bronchial pneumonia resulting from AIDS. Mercury and his manager issued a statement confirming that he had AIDS the very day before he died. It had been widely speculated for a couple of years due to his gaunt appearance and Queen’s sudden lack of touring. Freddie died 27 years ago today. He truly embodied Queen’s identity and changed the course of rock and roll forever. Watch Queen’s full performance at Live Aid in 1985 below.